Do you need some new hydraulic parts in Whittier CA for your mobile, industrial, agricultural, or fluid control equipment? 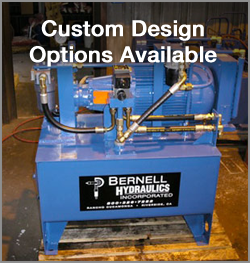 Come to Bernell Hydraulics. We have an excellent staff of sales people and technicians that are ready and willing to share their knowledge of hydraulic parts and systems with you. Just let us know your requirements as to temperature, pressure, fluid compatibility, heat and chemical resistances, etc. and we’ll direct you to quality parts from major brand name manufacturers that will get the job done and deliver the level of performance you expect and deserve. If you want us to install your new parts for you and repair your equipment, just let us know and we’ll sign you up for our 24 hour mobile repair service. If you know exactly which parts you need, you don’t even have to come to the store just give us a call and we’ll send one of our mobile techs to your job site with the new parts in hand. We always test the equipment after we’ve performed any work to give you peace of mind that the repair has been done correctly. Next time some of your hydraulic parts in Whittier CA wear out, you can handle the problem with a single simple phone call to Bernell Hydraulics.